What I am reading, and what I am trying to persuade my 10 year old son to read. Last Sunday we went to Bowes Museum, near Barnard Castle in County Durham. It has been one of my favourite places since I went there on a school trip as a child. The building is fabulous - a French chateau dropped into the beautiful countryside of Teesdale. It was established by John and Josephine Bowes as a purpose built museum to house their extensive collection of art and artifacts. It was first opened to the public in 1892. We saw that exact same thing last Sunday, almost 150 years after Mark Twain did. The sophisticated 21st century audience still gave a round of applause when the swan swallowed the fish! There is lots to see in the museum, but we had gone specifically to see two temporary exhibitions; Henry Poole & Co. Founder of Savile Row: The Art of Bespoke Tailoring and Wool Cloth, and Laura Ashley, Romantic Heroine. Henry Poole & Co. was opened in 1806 and established Savile Row as the centre for bespoke tailoring in London. Their customers included Winston Churchill, Charles Dickens and Edward VII. They have their customer ledgers from 1846, and some of them were on view, open at the pages of their famous clients. When Edward VII was Prince of Wales he asked Henry Poole & Co. to cut a short, blue evening coat for him. This garment is said to be the original dinner jacket (tuxedo in the US). 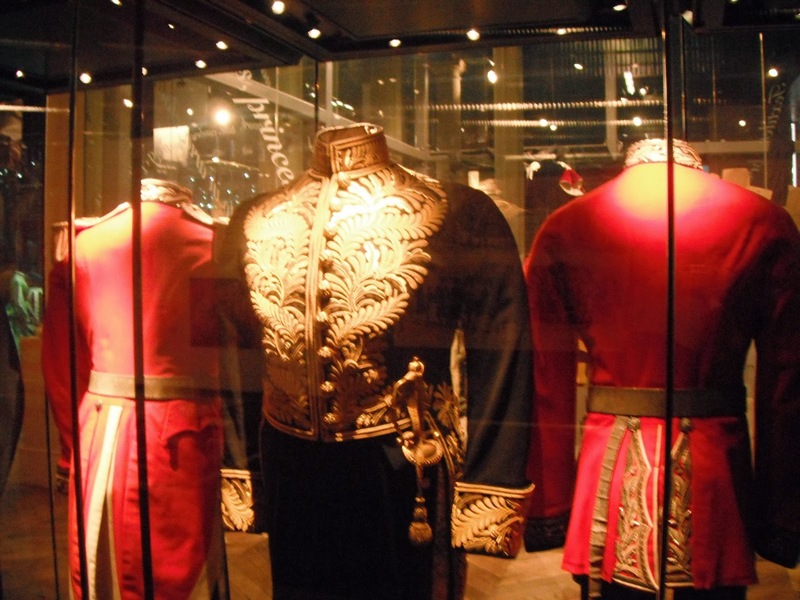 They hold Royal Warrants still, including the Royal Warrant for the Queen's State Livery. 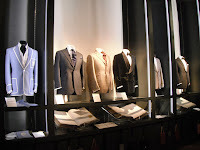 The exhibition showed various styles of suits, and also explained the process of making a bespoke garment. 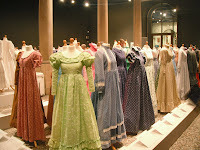 There were fabric sample books available so we could feel the wonderful quality of the material used in these garments. 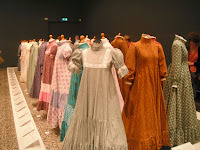 The Laura Ashley exhibition showed, in the company's 60th year, almost 100 examples of Laura Ashley dresses from the 60s and 70s. them looked quite restrictive with high collars and tight sleeves. I was puzzled as to why, after women's fashion had become so much more free in the 60s, women would choose these styles again. I wouldn't particularly want to wear most of the dresses, but I did like the prints. It had been 5 or 6 years since I last visited the Bowes Museum and I certainly won't be leaving it that long again. It's the kind of place where there is always something new to see, and things that have been there all the time that you never noticed before. I've been to the Bowes Museum but not for a long time and all I can really remember about it is the silver swan. I must try to go again soon! Helen the swan is lovely, but there's loads more to see there. They have regular events, there was an Autumn Market there last weekend. It's a really vibrant place. This sounds like a wonderful museum. I would have loved to see the Laura Ashley exhibition. I don't know why these dresses were so popular in the eighties, but I wore them and so did my daughters! Very happy it was a short-lived phase! I'd like to see the Laura Ashley exhibition, too. You're right they look as if they are part of a Jane Austen film set. My favourite Laura Ashley branch in Brighton is now a Cath Kidston! 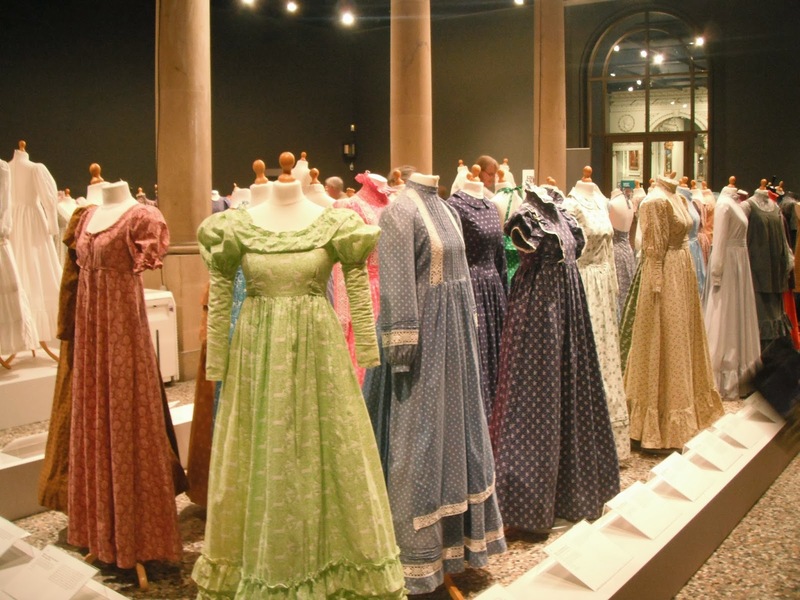 I guess "restrictive" depends on one's personal comfort level, but I wear, okay, not full-blown Laura Ashley, but long, possibly prairie-esque, dresses fairly regularly and don't find them restrictive. Nobody's wearing them with the corsets and layers of petticoats and boned bodices and such that actual 19th century dresses had. 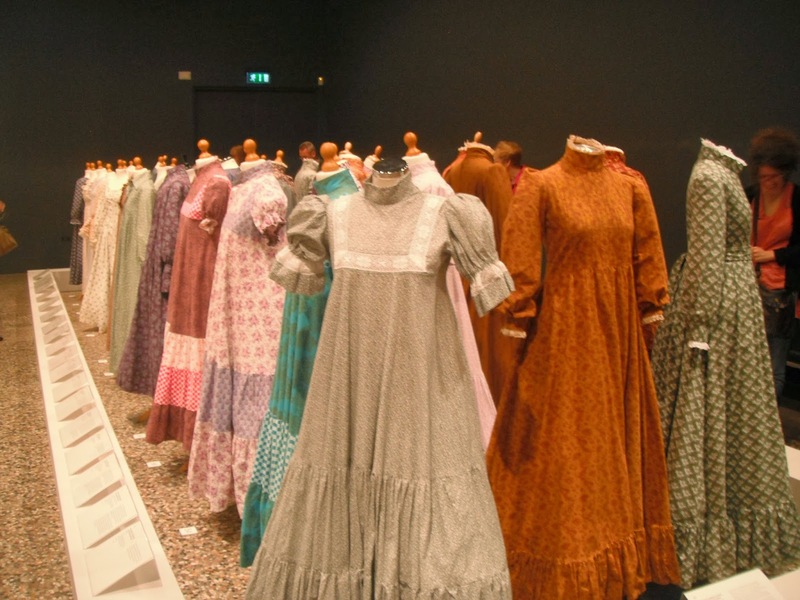 There is far, far, less clothing involved in a 1970's prairie dress than in an actual Victorian gown. I think a lot of the appeal was in the colors and in the romantic feeling of wearing an admittedly rather impractical dress. I suspect, also, that a lot of these dresses were worn for "nice" occasions and not to go grocery shopping or whatever, because floor-length skirts really don't work that well on the bus or on stairs. One expects dressier clothes to be a little more restrictive. My name is Joanne. I live in the north east of England with my husband and son. I have always been an avid reader and assumed that any child of mine would be the same. I was mistaken.